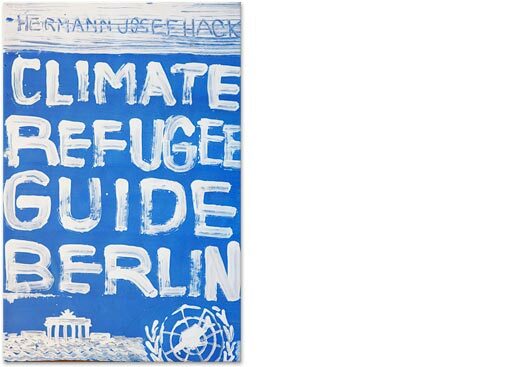 this “Guide for Climate Refugees“ is perhaps your first encounter with a topic which so far has hardly entered public consciousness. 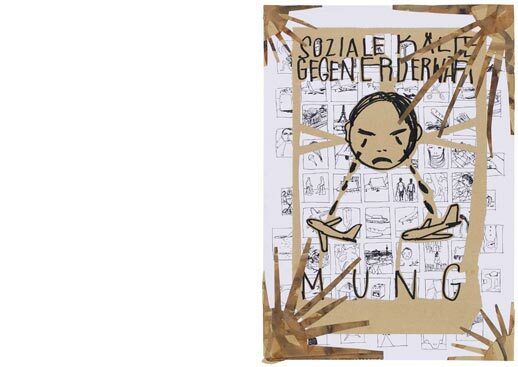 The artist Hermann Josef Hack sees himself as a “sensor“ for social and political challenges. For years he has been drawing the public‘s attention to serious and pressing social problems with his “happenings“ on topics such as unemployment, poverty or climate change. 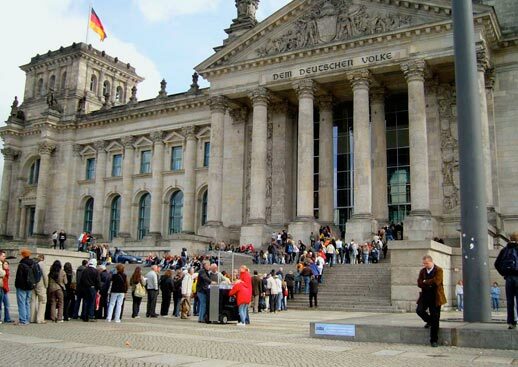 Hermann Josef Hack presented me with a sign marked “Climate Refugee Camp German Bundestag” in front of the Reichstag building on 20 September 2007. 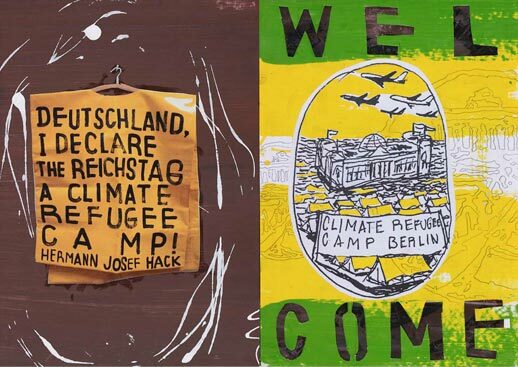 He thereby symbolically declared the Reichstag, the seat of the German Parliament, a Climate Refugee Camp, thus provoking a critical analysis of the social consequences of worldwide climate change. After all, each and every one of us must accept responsibility if we want to prevent the catastrophic effects of climate change – due to floods, tornados, drought and hunger. 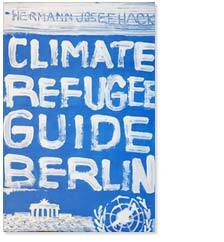 Hermann Josef Hack’s campaign should inspire politicians. I hope that it will encourage them to take the necessary action. in 1992, he had already managed to interest an international public in the social consequences of climate change. Hack pioneered the use of the Internet for “social sculptures” along the lines of his teacher, Joseph Beuys, and demanded that the new media should be made available to everyone. In 1994, he launched the first videophone link from the North Pole to the South Pole and maintained contact with researchers around the world in an attempt to communicate their results to as many people as possible. 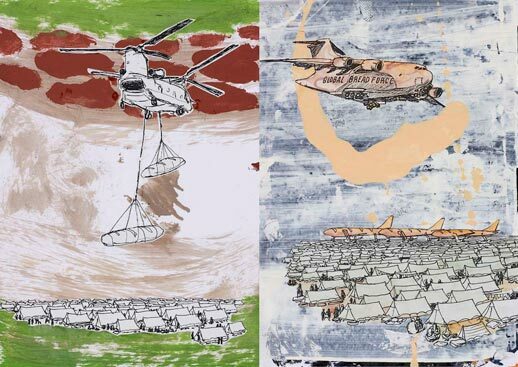 Hack’s projects extend throughout the world – including Cairo, Los Angeles, Spitzbergen and the Antarctic, and even involved the D2 space mission in 1993, which had one of the artist’s works on board. They make him a global player with an eye for the interests of the socially weak and excluded. Recognized by UNESCO as a Project of the Decade 2007/2008 and awarded numerous international art prizes, Hack’s work continuously seeks new paths to activate the potential of as many people as possible in solving challenges of a global dimension. He attracts considerable publicity in the media by involving high-ranking players in his actions, such as the Federal Chancellor (“Poor Socks Carpet“) or top researchers (Polar Night). 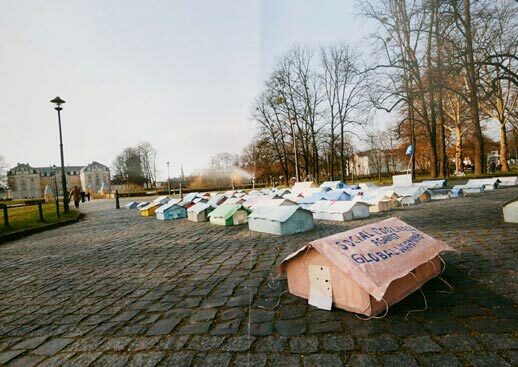 In his large-format paintings on tarpaulin, he anticipates the development of our society, powerfully but not without subtle humour.